The Commonwealth’s $444 million grant to the Great Barrier Reef Foundation will ensure ongoing employment for a significant number of scientists (which is no bad thing), but will not save the reef. Many reef scientists are doing an admirable impression of one or more of the 3 wise monkeys, and finding ‘purpose’ in looking for ‘the super-coral’, designing large shade sails or in the belief that endless monitoring of the inexorable decline of the reef will make a difference. 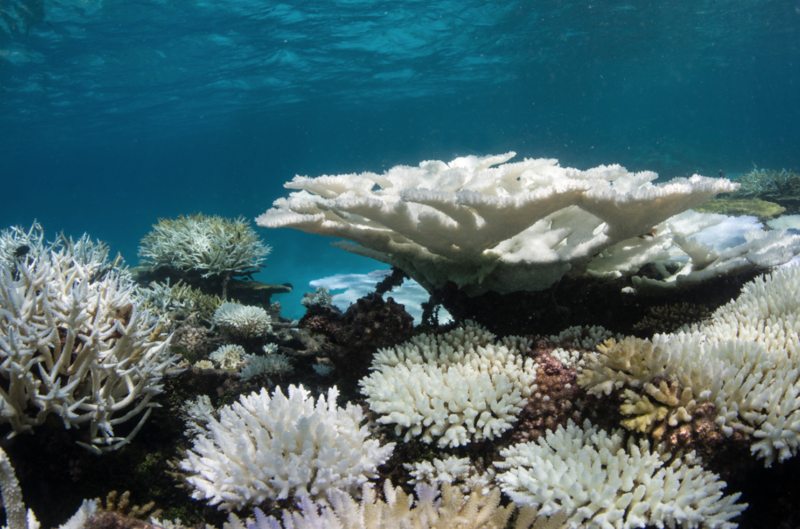 Even clearer than the evidence of climate change, is the evidence that the reef is in very serious decline, and that this decline in all likelihood cannot be reversed. The reef-scale surveys and meticulous piecing together of environmental information by Professor Terry Hughes and colleagues at the ARC Centre of Excellence – Coral Reef Studies make this abundantly clear. In the 1980s serious bleaching events – the result of unusually warm waters – occurred about once every 25 years. Today, they occur about once every 6 or 7 years. A Porites ‘brain coral’ takes over 50 years to grow to a meter in diameter. Porites bommies 4, 5 and more meters in diameter are being killed by bleaching events. Do the math. As Assoc. Professor Tracey Ainsworth from the University of New South Wales said at last month’s Australian Coral Reef Society’s annual conference, ‘if you’re under 30, you’ve never seen a ‘normal’ reef’. The climate is changing and the seas continue to warm. We are only just beginning to understand the ecological changes this trend of warming will have on the ecology of our oceans. Regardless of what changes we make in energy production, and regardless of what we spend on monitoring, research and mitigation, over your lifetime, and likely over your children’s lifetime, the seas will continue to warm and the reef will continue to decline. There will be less coral and less species of coral. There will be less species of fish and invertebrates, and in particular those that are dependent on corals for food and shelter. What effect will this have on animals higher up the food-chain and on fisheries? No one knows. Unbelievably, there are still some who continue to say that there’ll always be a bit of reef somewhere to take the tourists. Based on the trend of increasing frequency of bleaching, it’s likely that you won’t be able to find an un-bleached reef for your holidays in as little as 15 – 20 years. And here, we’ve only been considering the consequences of bleaching. You wouldn’t believe the varied ways ocean acidification (and yes, it’s clearly happening too) effect the ecology of the reef. So what should the Great Barrier Reef Foundation be doing with its windfall? The Foundation’s web site makes clear that its priorities are supporting research and management that increase the resilience of the reef and the rate of its recovery, and supporting the development of ‘game changing breakthrough’. Given the growth rate of many corals and the scale of the reef (and of bleaching events), large-scale restoration remains a ‘pipe dream’. However, increasing the reef’s resilience (by decreasing environmental pressures) can buy time. A reef less stressed by the impacts of catchment run-off is more likely to survive temperature stress. And time is critical to innovation. It’s likely that innovative approaches of any scale (the ones we really need to achieve other than ‘cosmetic’ benefit) will be quite radical – like the current proposal to increase the reflectiveness of clouds (thus reducing the amount of radiation that passes through the clouds to heat the sea). Are we ready to embrace such innovation? Do we have the political system capable of embracing it? An organisation like the Great Barrier Reef Foundation is ideally placed to sow the seeds for a change in thinking in Canberra. One thing we all agree on: there is no time to waste. How many fish can you count in this photo?